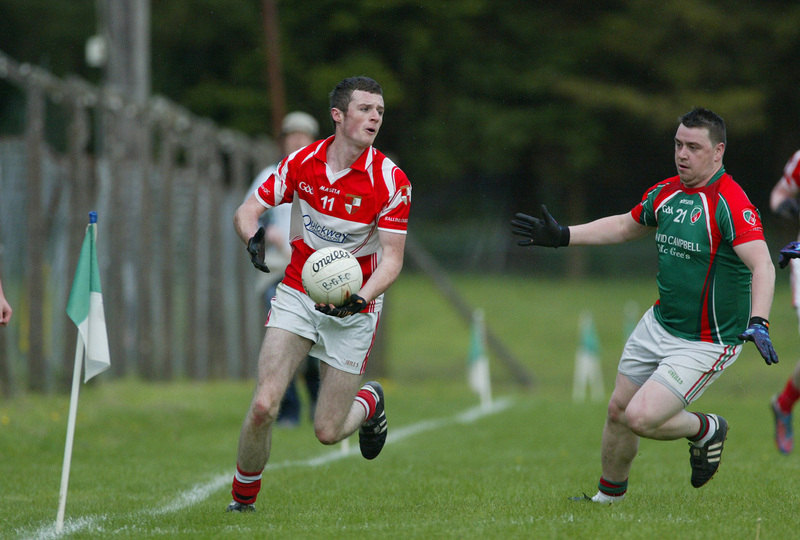 Ballinlough got their Division 1 league campaign back on track with an impressive victory over Wolfe Tones in windswept conditions in Ballinlough on Sunday. The home side were still missing some key personnel through injury and suspension, but the strength in depth available for selection to Tommy Shine was evident as a his side saw off Wolfe Tones with seven points to spare. Tommy McCullen opened the scoring in the second minute, splitting the posts after a good team move. Five minutes later, Kevin Devine doubled the ‘Loughs lead with a sweetly struck free. Wolfe Tones were struggling to find their feet in the contest, with the strong breeze seeing them kick several wides before Cian Ward opened their scoring in the fifteenth minute with a close range free kick. Moments later, the younger Ward brother, Fiachra, got the better of the ‘Reds defence and finished powerfully to the back of the net to put his side in front for the first time. Cian Ward tagged on further scores from frees to extend the Tones lead, before Lorcan Maguire scored a fantastic point after a well worked move by Ballinlough to reduce the deficit. This proved to be the last action of the first half, and saw the visitors enter the break leading by 1-3 to 0-3. Ballinlough were out of the blocks quickest in the second half, and found the back of the net in the opening minute. A high ball was floated into the area by Peadar Byrne, and Mark McCullen was on hand to flick it past the despairing keeper and raise his sides first green flag. Shortly after, Devine converted another free to put the home side back in front. Wolfe Tones got back on level terms, when their powerful midfielder Alan Callaghan scored a superb individual point after a surging run from deep in his own half. Fiachra Ward then edged his side further ahead with a further score. With ten minutes remaining, Ballinlough were playing the better football, but still lagged behind on the scoreboard. A moment of confusion in the Wolfe Tones box led to a penalty being awarded to the ‘Lough, and Byrne made no mistake dispatching it down the middle to restore his sides lead. It wasn’t long till they extended the lead, lively substitute James O’Higgins with a fine finish to the back of the net, after good work by Byrne and Mark McCullen. McCullen himself then closed the scoring with the best point of the day, a long distance shot off his left boot after a great pass by Ronan McGuinness. The large crowd which turned up to watch the first game of Ballinloughs league campaign to take place in their newly upgraded pitch will have been left impressed by what they saw, and hope this form will continue further into the year. There was great, hard working displays on show across the team, with Michael Geraghty, Lorcan Maguire, Cian Mallen, Sean Geraghty and Mark McCullen particularly impressive. Next up for the ‘Lough is a trip to play St. Pats in the opening round of the Feis Cup. Ballinlough: L. Gibney, E. Smith, P. Muldoon, R. Farrell, M. Geraghty, B. Smith, Junior O’Reilly, T. McCullen (0-1), L. Maguire (0-1), Cian Mallen, S. Geraghty, M. McCullen (1-1), J. Tunney, P. Byrne (1-0), K. Devine (0-3). Subs: J. O’Higgins (1-0) for T. McCullen, R. McGuinness for Tunney, J. Baugh for O’Reilly.